KCET 2019: Hall Ticket Released!! 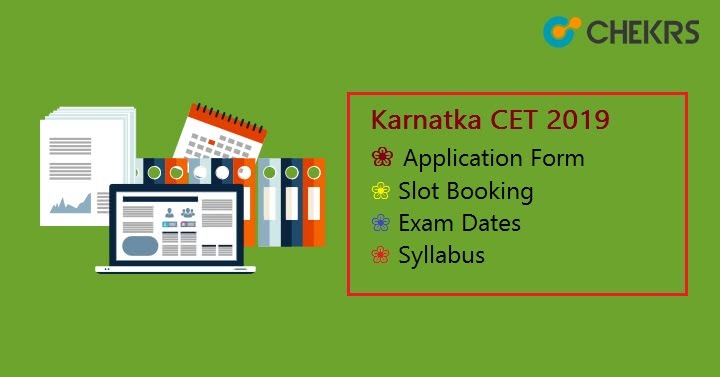 Karnataka CET 2019: Karnataka Common Entrance Test is organized by the Karnataka Exam Authority (KEA). It is a state level entrance exam conducted to offer the admission in the first year of engineering, agriculture, pharmacy and various other courses. In Karnataka, various colleges and university are ready to provide seats to all the candidate on the basis of KCET 2019 Score. Latest Update : KCET 2019 Hall Ticket Released!! Check the Link below. Latest Update : KCET 2019 Application Form Last date has been extended till 20th March, Check the Procedure below and fill the form. Latest Update : KCET 2019 Scheduled has been revised by the authority, Check the table below for updates dates. Latest Update : KCET 2019 Application Form is Available from 1st Feb 2019. Fill it before last date. Latest Update : KCET 2019 Exam Dates has been released, Check the table below. For the candidates who want to take the admission in the first year of engineering, agriculture, pharmacy, and various other courses can fill the form of the KCET. Candidate needs to go on the official website of KCET i.e. www.kea.kar.nic.in. The details related to the release date of notification, online application starting date etc. are provided below the table. Candidate can prefer this table for their simplification. Candidate must participate in All India Thal Sainik Camp (Boys)- All India Thal Sainik Camp (Girls), All India Nau Sainik Camp and also the candidate hold a certificate, which was obtained during 5 years of study in Karnataka, between the classes of 8 and 12. Candidates participated in All India Movalankar Shooting Championship with GOA and KAR Director team. Candidates participated in National Level Youth Exchange Program, Foreign Naval Cruise, All India Mavalankar Shooting Championship. Candidates must have won the cups and medals in Super-A Games or B-Games in the five periods of basic education in Karnataka i.e. from class 8th to 12th. In this category, only those candidate falls who received the ‘President award’ as ‘scouts and guides’ during his 5 years of education from class 8th to 12th. At the time of the document verification candidates have to show the “President Award certificate’. Child and daughter of Jammu and Kashmir transients can assert situates under Jammu and Kashmiri migrants quality. The candidate who falls in this category has to give the caste Income certificate/ caste certificate which is issued by the Jurisdictional Tahasildar with the government rules and regulation. Candidate needs to have the form of ‘D’ in case of ST, form ‘E’ in case of category-I, Form ‘F’ in case of OBC (2A, 2B, 3A, 3B). Candidate needs to provide the medical/Physical disability certificate who falls under this category. Son/ daughter of Defence personnel has the certificate of Defence. Candidate falls under this category need to possess Defence certificate issued by Deputy Director/ Joint Director. In this category all the candidates including the General category all eligible for the admission, in this the candidate has to provide a certificate issued by the concerned Tahasildar. A candidate who is domicile of areas/district including Raichur, Bellaryare, Bidar, Koppal, Gulbarga, Bellaryare, yadgir, Koppal can have the seat who falls under this category. The Application Form is started from the month of the January. The mode of the application form is online. Candidates who are interested can fill the form from the website www.kea.kar.nic.in. For not facing the problems while feeling the form we provided here the information related to the KCET Application Form. The application form for the KCET 2019-20 will start from the January. The application forms are available in online mode. The application form will be available from the month of the March. Candidates upload the scanned photos of themselves and also upload the thumb impression of their left hand with signature. Make sure of the size when the image is been uploaded. Make the entry correct and meaningful manner. Candidate needs to check the all the entry filled by them are correct. After completion of the whole of the process take print out of the application form for the future reference. For the candidates who were appearing in the Karnataka Common Entrance Test exam, have to know the syllabus. The KCET Syllabus will help them to know the exam pattern and the topics which were coming in the exam. So for the simplification for the candidate, we provided here the detailed topics which are come in the exam. For the candidates who want to book their seats in the Karnataka Common Entrance Test have to know the reservation of the seats. The seats are reserved by the category wise. So we provided here the all the information regards the seat reservation in the KCET. Note: The explanation of each slot booking is provided below in the details. A candidate who alleges for the booking of the slot in KCET will have to fulfill the eligibility criteria. For that purpose, we provided here all the information regarding the KCET Slot Booking. Applicants who given the exam in the KCET is required to know the answer which is marked by them. The KCET Answer Key is released after the 2 to 3 days when the exam is scheduled. With the help of answer key applicant will be able to check the answer marked by them. The KCET answer Key will be released on the official site of the KCET. An applicant who given the exam of KCET can check their result on the official website of the Karnataka Examination Authority. The link of the result is available at the official site of KEA. To see the result applicant require to enter their registration number, image(re-captcha) which is given after they required to click on the submit button to see their result. The KCET Result 2019 appears on the screen. Applicants who want to take the admission in the KCET colleges are required to clear the cut-off marks. The cut-off marks are the minimum marks which are used by the applicant during the KCET Counselling during the admission in the colleges. Applicants who secure more than cut off marks are only considered for the admission. After giving the exam the KCET Merit List will releases. The merit list is prepared on the basis of the marks obtained by the candidate in Physics, Chemistry, and Mathematics. For qualifying, the exam applicants require to obtain minimum 50% marks in each subject. A candidate who wants to take the admission in the KCET is required to fill the KCET Counselling Form 2019. On the day of the counseling, the applicant requires to bring the document for the verification. Candidates note that the allotment of seat will be done on the basis of the choices and rank obtained in merit list filled by the applicant. KCET 2019 is a great opportunity for all the interested and eligible candidates. Candidates are advised to check the criteria and fill the application form in between due dates. After qualifying the KCET exam candidates will be called for the KCET 2019 counselling and after completing all the procedure candidates will get the admission in the preferred course.